Frankie Goes To Las Vegas The long and constantly-mutating career of Frank Sinatra was entering another new phase in 1960.He was gravitating away from LA and towards Nevada.Ava Gardner was finally behind him, and the Cal-Neva Lodge was the new reality.The 'ratpack' was in place around him, the court of King Frankie.Flashy neon credits at the start of this, the first of the ratpack movies, seem to herald a new decade and a new Sinatra. Lawford, Martin, Davis - the gang's all here, and the blurred boundaries between showbiz and private life seem to have vanished for good. This is the world of martini machismo. Handsome 40-something guys who've been around the block a couple of times wear 'broads' like scarves, and discard them just as easily.Every woman in this film is a pushover, from the miserable wife Bea (Angie Dickinson) to the easy lay Adele (Patrice Wymore). 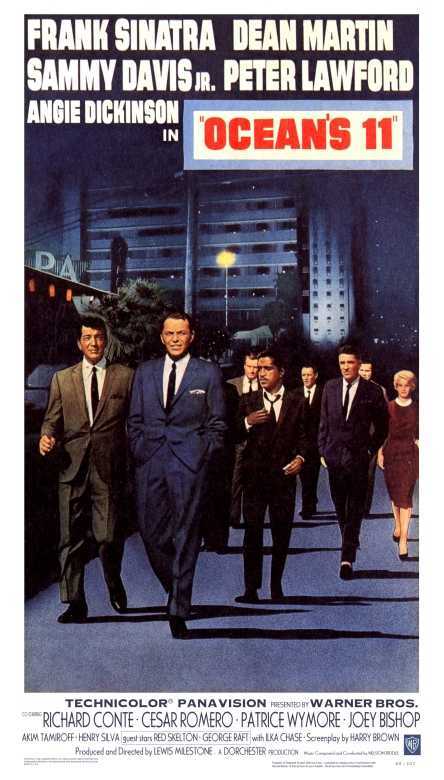 Girls eagerly massage Peter Lawford's shoulders or lounge around the apartment looking silently decorous, until Frank summarily orders them out - the boys have serious business in hand, so 'no dames'. The film cracks some sneering, humourless jokes at women's expense.Frankie reminds the petulant Adele that she was tolerated only so long as she remained sexually interesting. The stripper at which everybody leers turns out to be Vince's wife. Martin's line "Take the vote away from women - make slaves of 'em" is no more than a crude enunciation of the film's undercurrent. The cynical, irreverent Sinatra sets the misogynist tone. Burlesque dancers peel off their clothes to "The Tender Trap", Sinatra's allusion to the female pudendum.As Adele tells Frankie, "You really are a rat". Sketchy and virtually irrelevant, the plot concerns a bunch of paratroopers-turned-playboys who, craving money and thrills, mount simultaneous burglaries of five of Las Vegas' big casinos. 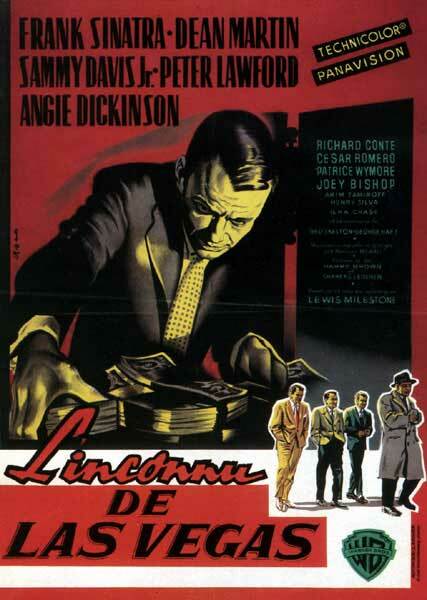 The slackness of the plotting is part of the film's relaxed, tongue-in-cheek style as Sinatra and Martin indulge themselves in what is almost a home movie. The 'blocking' of the actors is often clumsy and occasionally looks like an amateur dramatic society's production. That Dean Martin should, within 48 hours of the hatching of the plan, obtain a cabaret spot in one of the target casinos stretches credibility to breaking-point. His three-piece backing combo absurdly produces a big band sound. When Vegas is suddenly deprived of electrical power, Martin's microphone curiously keeps on working. 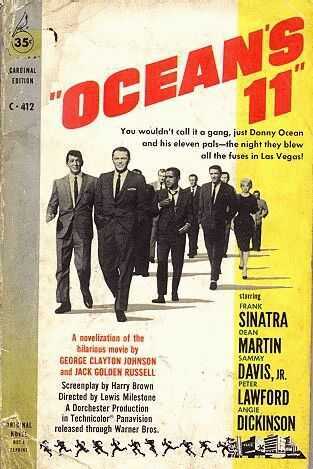 The ratpack are given perfunctory characters ('Danny Ocean', 'Sam Harmon', 'Josh Howard'), but nobody attempts to act. Ol' Blue Eyes doesn't sing at all. Martin breezes through "Ain't Love A Kick In The Head" and the marvellous Sammy Davis knocks out a stylish, swinging "E.O.Eleven". The film is a little too slow and a little too long. Quite why eleven conspirators were needed isn't clear, and the excessive number is cumbersome. 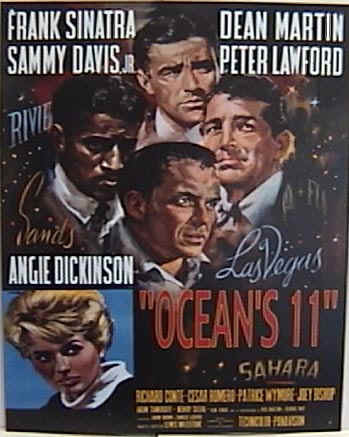 This is probably the best of the ratpack films, but that isn't really saying much.